With some randomness and last minute luck, I made it out to Product Camp Boston on Feb 28. The gracious hosts at the Microsoft Research Labs gave us this amazing venue for Boston Product Management professionals to learn, to teach, to network and just simply enjoy each other’s company. Check out the Flickr group to see pictures. The organizers led by C Todd Lombardo did an amazing job with the event and I am grateful for all their hard work. I figured I should note down the books, tools and links that were flying around during the event for posterity sake. This site was recommended by the session leader of Product Innovation Session. It appears to be a collection of interactive techniques/games you play to ultimately define your product’s future vision. The site and concept are based off of the book with the same name. Bob Levy who led the session Requirements Management Best Practices recommended these two books for building relationships among different teams. 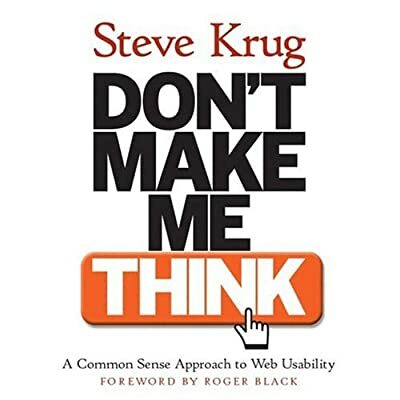 In my User Experience Session, folks were asking what books they should read to get the basics of User Interface Design and I recommended Steve Krug’s book : Don’t Make Me Think. Here are a few more books you can read if you are completely new to this subject and you’d like to get more into it. If you just want a quick and easy intro to graphic design, try The Non Designer’s Design Book. If you just want to add some visual thinking to your life, try Back of the Napkin. If you really want to get into the details, try About Face 3. If you were at ProductCamp Boston and have anything to add, please let me know in the comments! Thanks Aye, Great references. PCamp was a fun and productive day!